Trace the words of the Bible Verse: Job 12:7-10 (NIV): "But ask the animals, and they will teach you, or the birds in the sky, and they will tell you; or speak to the earth, and it will teach you, or let the fish in the sea inform you. Which of all these does not know that the hand of the Lord has done this? In his hand is the life of every creature and the breath of all mankind." 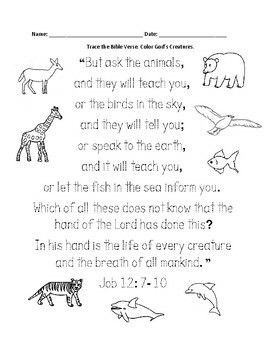 1 printable handout includes 8 of God's creatures to color (bird, deer, giraffe, bear, fish, whale, dolphin, tiger). FOR THE SHORTER VERSION (PSALM 12:10), click HERE. For worksheets to learn the Books of the Old Testament and New Testament, please check out the Books of the Bible Bundle. Thank you so much for using my printable handouts! Reviews are welcome and very much appreciated. Please follow me by clicking on this link: Follow This Store. Thank you again! God bless. Note: Illustrations used with permission from Pro Lingua Associates, publisher of Coloring in English - A Vocabulary Builder for Beginners. Coloring in English includes 400 everyday, basic vocabulary and sight words with pictures to color and learn.